We spend a lot of time sittin’ on our butts when we’re sourcing – it doesn’t matter if it’s Telephone or Internet – chances are you know what I’m talkin’ about! 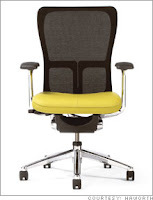 Here’s a site that details some office chairs – expensive – but what are we doin’ with the money we’re makin’ anyway? Take a little of it and invest in yourself and your processes – you’ll be glad you did! My brother recently installed a treadmill in his vet office that has a shelf where he can place a laptop - it's pretty cool and I can see it working well for Internet searchers but phone? All that huffing and puffing might/could just get in the way...but I've been thinking of a standing version desk - anyone gone there yet and what do you think?